I love the Muppets and I especially love Sesame Street. I watched it every day growing up. Before I was even putting sentences together I was saying "sunny days...sunny days." I had a very fantastical childhood, thanks to my magical mother (and her special closet full of fabulous costumes), and anything Jim Hensen created was a big part of it. My favorite toy for a while was a Miss Piggy puppet (until I left her out in the rain and she was ruined...tear). My brother and I had big wheels with Muppets on the back of them (mine Miss Piggy, his Kermit, until I broke the Kermit off the back of his because I was a total jerk as a kid). We had posters of characters up in our rooms, we knew the words to every song (C is for cookie, it's good enough for me) on Sesame Street, knew every word to every Muppet Movie, and watched Fraggle Rock religiously. Now that Baby M is of the age where she is actually paying attention to things on the television, we have started watching Sesame Street occasionally with our morning meal or for a distraction on my iPhone. And damn has it changed...not for better or worse, it is just different (except for Maria - how old is that woman???). It still appeals to people of all ages, and has that subtle adult humor here and there - have you see True Mud or the Mad Man sketches - but it is not your Mama's Sesame Street. 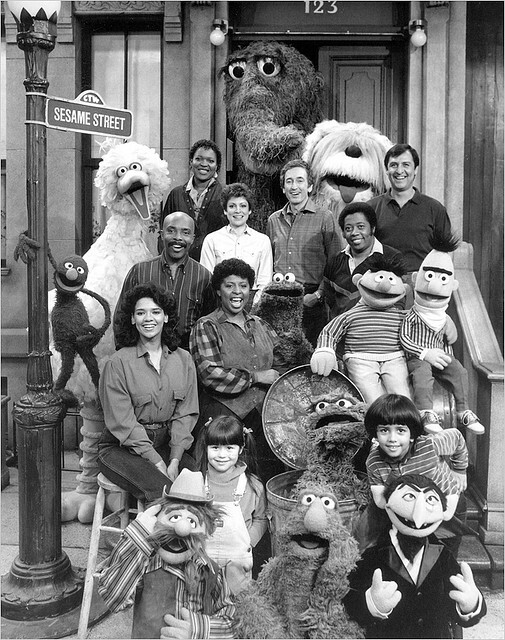 In the late 70s and 80s the stars of "the street" were Grover, Cookie Monster, Oscar the Grouch, Big Bird, Bert & Ernie. 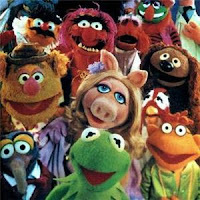 Super-Muppets, like Kermit the Frog (Hi-ho! ), also made frequent cameos back in the day. Guy Smiley was hosting game shows, The Count was counting up a storm, Don Music was playing his piano (and then banging his head on it), Telly was being whiny, the Honkers were honking...it was wonderful. Thanks to advances in technology there are a lot of different things happening than just puppets from the waist up! I am assuming that the old timers have retired to Florida, as you don't see much of the stars of the 70s/80s/90s. Bert & Ernie are still kicking around, but are now claymation detectives? Much of the show is done with computer animation now, and resembles most other kids shows on TV. There is a whole new cast of characters as you probably know...Abby, Rosalita, Zoe, Murray...and the king of them all is Sir Elmo. After doing a Google search, I discovered that Elmo was actually created in 1979, but didn't really become a main character until the mid-80s, which is probably why I don't remember him from when I was young. And now you can't go ten feet without bumping into some product with Elmo's face on it. Why do kids love him so much? Don't get me wrong, I love him very much. What is not to love? 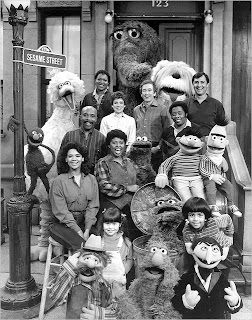 He is cute and furry, and has an adult sense of humor, but why is he loved so much more than all of the other main characters now on Sesame Street? Is it because he is so adored that he is all over everything everywhere, or is it because he is all over everything that we have come to love him so? I can tell you this that ever since she was 5 months old, Baby M has gotten a huge grin on her face every time Elmo is in front of her. Whether it is on the cover of the book (we have 3), in teether form (we have him on a key ring, as well as a stuffed version with plastic teething hands), on my iPhone (post to come about our favorite apps next) or on her clothing. I got her this long-sleeved Elmo tee from Old Navy and when she wears it she looks down at her shirt and starts to smile and giggle and then tries to give him kisses. Cutest thing ever. When Sir Elmo comes on the television she starts to giggle and clap...just for him, not anyone else. We even have a Zoe puppet that she loves, but she doesn't recognize her on the television or in books for some reason. Elmo is her first crush. Do your kids love the red, furry, ticklish Muppet too?? Ohhhh yeah. Ava is obsessed. We have that talking phone that sings "Elmo's World", and it's all I can do some days not to roll down the car window and chuck it out! Funny that I happen to come across your post...my 21 month old son is in LOVE with Elmo and my husband and I were just musing the other day about why Elmo and not any of the other SS characters. We concluded that it must be because he talks and acts like a baby, so that kids must relate to him better somehow.